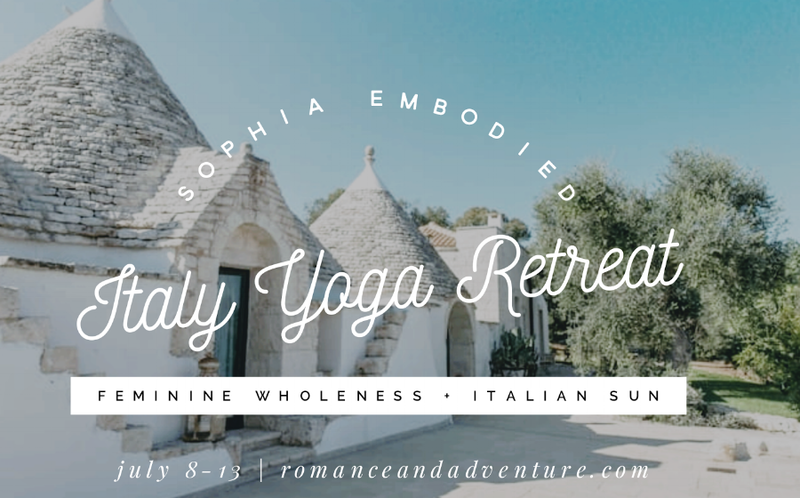 This July I'm taking 10 of you back to Italy with me for the Sophia Embodied Yoga Retreat! Southern Italy is one of my most special places in all the earth. It's rugged. It's ancient. It's holy. It's beautiful. I've enlisted the help of Kaitlin King of Yoga Soule to make this experience incredible for you. Think of this retreat as one part revitalizing practice of embodiment, one part training in the arts of feminine wholeness, and one part deeply nourishing girl time in an ancient region of Italy. There will be wine and sparkling water. And dancing. And pool time. And long meals with lots of laughter. And a dinner in an olive grove with more dancing under the moonlight! Want your own life of Romance & Adventure? Join the Romance & Adventure Community of Saints and we'll send you our personal roadmap of simple12 practices to create a life you TRULY lovE.